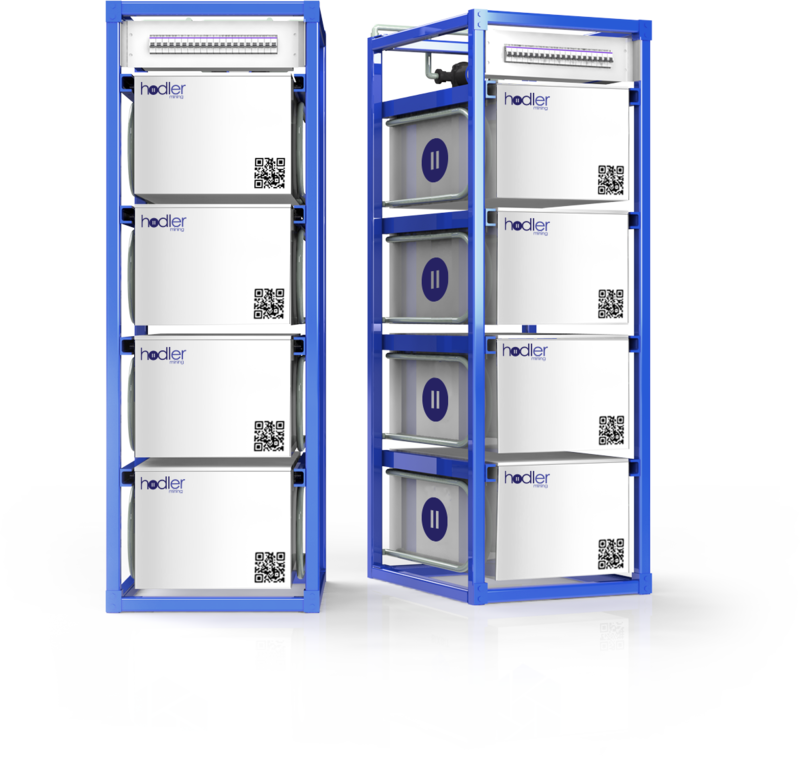 Hodler Energy is a concept that allows anyone to rent servers or computing power from machines installed at residential or commercial properties. Computer equipment produces heat; this heat is extracted from the servers using immersion cooling technology, the heat can be repurposed for warming rooms or to heat the water for showers or washing dishes. The technology is easy to set up and install without modification to the original hardware. Heat transfer can be integrated with any central heating/ventilation systems. Connectivity is provided via ethernet cables and has a backup system using integrated SIM cards. As rendering farms or mining operations do not require much bandwidth, a simple SIM card could run for over a year on the server. The units will be installed under a contract, and the owner will receive monthly payouts per hour that the machine is being used. We will launch this concept in Sweden. The whole concept will be presented publicly after the first round of investment has concluded. The first round of investors will need to review and accept our NDA before any further sharing of information. Before launching Hodler Enterprises and Qredit, our team had mined cryptocurrency for a few years, gaining invaluable experience in all aspects of mining. Following the launch of our first project (Qredit) we were contacted by a third party to create an ICO and deliver mining hardware for their project. This project was called Miniera. Unfortunately, the CEO of Miniera was forced to shut down that project. The initial plan was to mine an½y type of GPU based cryptocurrency and share dividends among it’s investors. By providing tokens to the investors, a snapshot can be taken from the blockchain and the dividends will be evenly paid to the token holders. Dividends can be received in 2 cryptocurrencies, Ethereum and Neblio. With future plans to allow payouts in Bitcoin and Qredit. Cooling mining hardware efficiently and cost effectively is the most challenging part of mining, cooling alone consumes roughly 45% of the total electricity needed. Our team researched various potential cooling methods. A few years ago, during a small pilot project, we began using immersion cooling to cool personal computers. We decided to take another look at this technology to establish if it was efficient to embrace and implement this solution with our miners. After extensive testing, it became evident that immersion cooling was the only way to increase efficiency and return on investment. After a successful test phase, we have managed to improve efficiency by up to 95%. With our Hodler Energy project, we have decided to go a step further and use the heat to warm buildings. In December 2018 the market consolidated a great deal, and it was nearly impossible to produce any mining profit in the Netherlands with the electric rate at $0.065 and by utilising GPU’s for mining. Hodler Mining was able to avoid costly mistakes by not committing early investors’ funds before the 2018 market consolidation. Instead, we became more creative in designing our own mining hardware and selecting best in software tools. GPU’s are typically outdated after two years, our team had to seek a long term solution. After extensive research and discussion with industry peers, we decided to utilise FPGA technology. Less equipment and cooling is needed to obtain the same return as GPU miners. Another significant benefit of FPGA miners is that they can be programmed to mine various algorithms using Bitstreams. In this way, the balance of power, cooling and mining became efficient again for our investors and us. On 20th November 2018, we received notice from an official finance agency in the Netherlands, they stipulated that Dutch residents were not allowed to participate in the project until they had completed their research. The research took place over the course of a few weeks, and during that time we added a large banner message to the website highlighting that at this time Dutch residents could not invest in Hodler Mining. The news caused some new and existing investors to become concerned about the projects ability to move forward. The research concluded on 11th January 2019. The result was positive, and we were permitted to continue our project with the current conditions and restrictions lifted. However, locating cryptocurrency projects in the Netherlands is still a grey area, and we have decided to adjust our plans regarding the location of our mining project. While we had taken all steps to register our company officially in the Netherlands and following all guidelines to avoid possible future challenges, the action taken by the Dutch agency caused us to reconsider the best location to register this company. During the temporary ban, we started to assess alternative sites to continue our project. The goal was to find a cryptocurrency friendly country with low electricity prices and cost-effective locations for our facility. Following detailed consideration we decided to migrate our company to Sweden where the electricity rate is circa $0.05 per kWh and competitive commercial property prices starting at $10,000. Sweden is an attractive location for cryptocurrency projects as they are open to new and green technologies. A number of team members have lived in Sweden, speak the language fluently, and one even had a former company registered in Sweden around 2012. It was now apparent that Sweden is the place to be for all of our projects. Our goal was to find a property in Sweden to launch Hodler Mining, Qredit and Hodler Energy all at the same time. Hodler Mining and Hodler Energy will fuel each other. We will use immersion cooling technology for the mining operation and re-use the heat produced to provide sufficient warmth for the office building. The companies new location is in Sweden, relocation is scheduled to take place during February 2019. The mining hardware order is due to be placed between 26th January and 7th February 2019. The minimum investment for Hodler Mining has increased to 25 tokens per order. For our investors, we have created a private telegram channel called the 500’s club to avoid spam and unrelated information by advertisers. Members of the 500’s club will receive all project related updates before being released to the public. Hodler Mining will be using FPGA miners to ensure a profitable future for its investors. FPGA miners consume less energy per hash and use less floor space than comparable GPU or ASIC setups, providing us with more space and allowing us to reduce the energy costs associated with cooling equipment. FGPA’s are far more flexible than GPU’s & ASIC as they can be configured to mine a broad range of Cryptocurrencies. FGPA’s allow for high-speed, automated algorithm switching ensuring profitability is maintained with no perceivable downtime between switching. Hodler Mining will utilise immersion cooling technology to cool the FGPA mining hardware. Immersion cooling ensures equipment is not exposed to environmental variables like dust which if left can cause fire and also increase overall operating temperatures. Mining hardware cooled correctly extends operating life and requires less maintenance when compared to traditional cooling methods. Sweden is a crypto-friendly country that allows its residents to participate in crypto-projects without any restriction. Sweden is a country with a lot of data centres. The reason for this is that Sweden has an overcapacity of electricity and provides a circa 95% discount for green and efficient data centres. Unlike other mining projects, Hodler Mining gives investors and participants the choice to receive payouts in Ethereum or Neblio. Additional coins and tokens will be added that support smart contract functionality. The key is to offer tokens that share the profit that is being made with Hodler Mining. The funds raised by offering tokens will be used to purchase mining hardware. We will focus on mining a range of profitable coins, 90% of the general profit will be shared with all tokens holders. Wallets with unsold tokens are not included in the shared profit. Which means that only people who have tokens will be rewarded. Hodler Enterprises will be retaining 10% of profit for future developments and producing additional profit by selling similar hardware with immersion cooling technology through Hodler Energy. Hodler Mining tokens are valued at $150 per token. Unlike traditional mining ICO’s, the reason for increasing the price per token is to cover the costs of mining-related fees. With lower-priced tokens, it is not profitable for any party to reward investors with tokens that have a lower value than the actual transaction fee. At Hodler Enterprises we take our customers and investor diligence very seriously. Identity verification is offered by a trusted third party called “Token of Trust”, the costs to review your identity will be absorbed by Hodler Enterprises. The review is necessary to ensure we are working with trusted individuals and companies, reducing the risk to Hodler Enterprises and its clients. Following successful verification, you will be connected with a Hodler Mining team member who will provide account management services. Each order will be discussed, reviewed and confirmed. Tokens will be transferred to your personal wallet following completion of payment. You will be invited to join our private telegram channel, where you can discuss and provide input into future companies decisions, providing you with a voice on our future developments and business direction. At Hodler Enterprises we take our customers and investors very seriously. Your identity will be reviewed by a 3rd party called token of trust, the costs to review your identity will be paid by Hodler Enterprises. The review is a basic check to avoid possible scammers that are looking for official documents from our company to scam other companies. After the review you will be connected with one of the team members so we get to know each other. This will be your account manager for Hodler Enterprises. The order amount will be discussed and the tokens will be transferred to your wallet after payment. You will be invited to our private telegram channel to discuss about the companies decisions and even provide your own opinion about future developments. Use the Badger wallet for SLP tokens. The ticker for the SLP Hodler Mining token is HDLRB. Holding this token in your wallet will allow you to receive payouts in Bitcoin Cash. Use the MetaMask wallet for ERC20 tokens. The ticker for the ERC20 Hodler Mining token is HDLRE. Holding this token in your wallet will allow you to receive payouts in Ethereum. Use the Orion wallet for NTP1 tokens. The ticker for the NTP1 Hodler Mining token is HODLR. Holding this token in your wallet will allow you to receive payouts in Neblio. With Hodler Mining it is possible to receive payouts in Bitcoin Cash, Ethereum or Neblio. To receive payouts, you simply need to hold to tokens in your wallet and make sure that the amount of token is 1 or more. Please use the wallets above to store your tokens. You can also store your tokens in hardware wallets or other wallets, please contact us for more information.